How many times have you locked yourself out of the house with no other reasonable way of getting inside? You don't have to break that side window to let yourself in. Just call the Lock Squad. 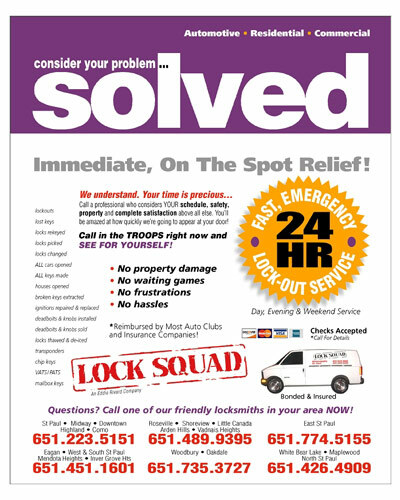 The Lock Squad can save the day with our 24-hour mobile locksmithing services. We offer expert lock services with key duplication, providing master keys, removal of broken keys and emergency automotive lockout services. A full selection of secure doorknobs and dead bolts are also available. With more than five years of professional locksmith experience, the Lock Squad offers all our customers top quality and expert locksmithing services. We service the counties of Ramsey, Hennepin and Washington. Call us today for our expert services. Web site for a 10% discount on services!